I was pleasantly surprised by this granola. 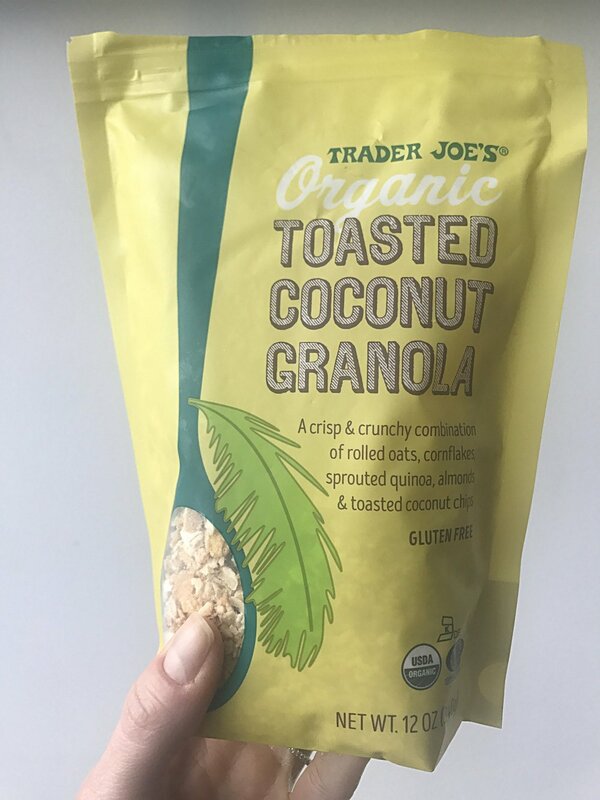 I usually like to eat Purely Elizabeth's grain-free granola, but this is actually pretty good, and I was surprised at how little sugar it had for how sweet it tastes. I also like letting it soak so the cornflakes get soggy, almost like a muesli. I will definitely be buying it again as I love EVERYTHING coconut-flavored. When I was first diagnosed with celiac disease, Fruity Pebbles were definitely not gluten free because I remember looking and seeing malt flavoring or malt syrup. Now, magically :), they are. I love them. They don’t quite taste the way they used to (probably because of the lack of malt flavoring), but they’re still great, and I love that I’m able to eat them now. Always check the box because if they’ve change formulas, they can always change again. But I am happy to say that the last few boxes I’ve purchased are definitely gluten free and didn’t upset my stomach at all. Now that I’ve maxed out the dessert and crackers/chips category, I will move on to my new favorite obsession: CINNAMON CHEX. As I kid, I loved Cinnamon toast crunch and i would occasionally get it as a treat as an adult. Once I was diagnosed with Celiac disease, I thought I would never have a cereal experience quite like that again until.....3 weeks ago when I finally discovered Cinnamon Chex. I like Regular Chex well enough, but they’re generally pretty boring. These Cinnamon Chex fulfill my childhood need for Cinnamon Toast Crunch, and I actually think I like them better because they’re not quite as sweet. I would encourage every gluten intolerant person to try these out (not for health but definitely for happiness). I think they’re Phenomenal. More information can be found on their website.